I’m sitting here with an empty cup of coffee, thinking if I should make myself a new one, but decaf this time as it’s late and I want to go to sleep in a few hours. I used to think coffee had no effect on me, but lately I’ve come to the realization that it does, at least in the evening. It’s also pouring outside, which you probably don’t care about at all, but I just thought I’d share it anyway. And, playing on a screen next to me is episode-whatever of The Real Housewives of New York City. If you’re side-eyeing me right now, well, I don’t hold it against you. I’m watching season 7, but I’ve never actually seen the show before so I kind of have no idea who the girls are. Not that it really matters if I know or not. 1. Leo finally got an Oscar! I know that was technically on Sunday, not Monday, but with the time difference it was actually Monday here so I’m putting it on this list. Anyway, he finally did it! I didn’t watch the show live, but that little bit of information was the first thing I looked up when I woke up in the morning. 2. Ariia is out. It’s a beautiful music player app, basically made for when you’re driving in your car and want to focus on the road, but still listen to music on your phone. I love it! It’s one of the side projects Rok is working on with his friends and I’m a proud girlfriend, so of course I want to tell you all about it. 3. The chocolate eggs have arrived! Ohhh, I always look at them at the store and never buy the giant ones, but I’m determined to get one this year. I think the fact that I can’t get them year-round is what makes them some appealing. 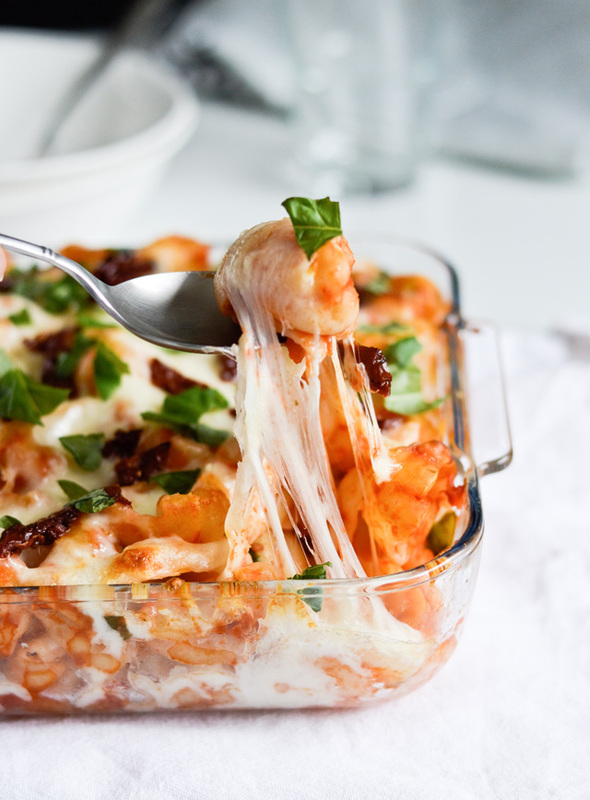 And I could count this mozzarella tomato pasta bake as the fourth awesome thing, because I adore pasta and comfort food like this is all I need even on a good day, but especially on a bad day. Like when I come home from the dentist’s or when I have a headache. 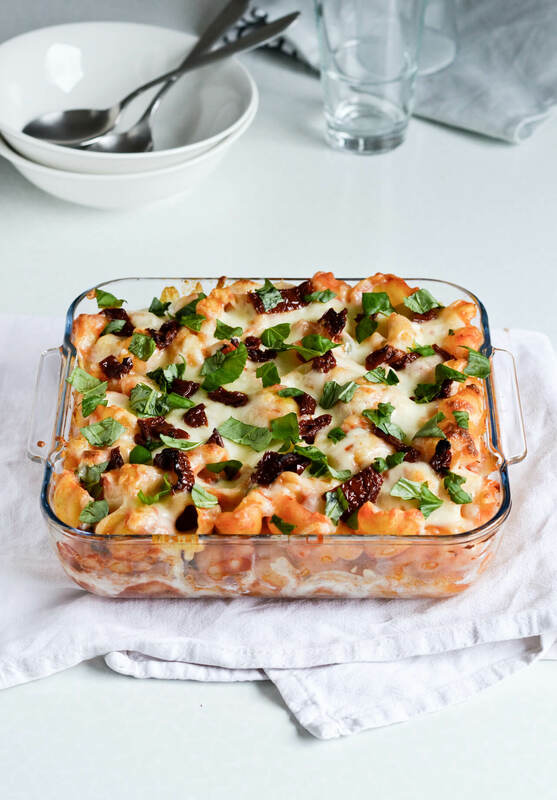 What I love about this pasta bake is that making it hardly takes any longer than making just cooked pasta with a sauce, but it tastes even better and looks prettier too. And while it’s made with very simple and few ingredients, it hits the spot. It’s filling and makes me feel 50 shades of cozy. I use homemade tomato sauce, although store-bought is fine too. If I do use store bought, I look for a pasta sauce that is made with tomatoes and onions, maybe a few extra ingredients, but that doesn’t use a lot of herbs or spices, because I like to use fresh herbs. True, herbs aren’t a winter thing, but most stores do carry them year-round and I really think fresh basil does wonders to this dish. But everything else you might already have at home! 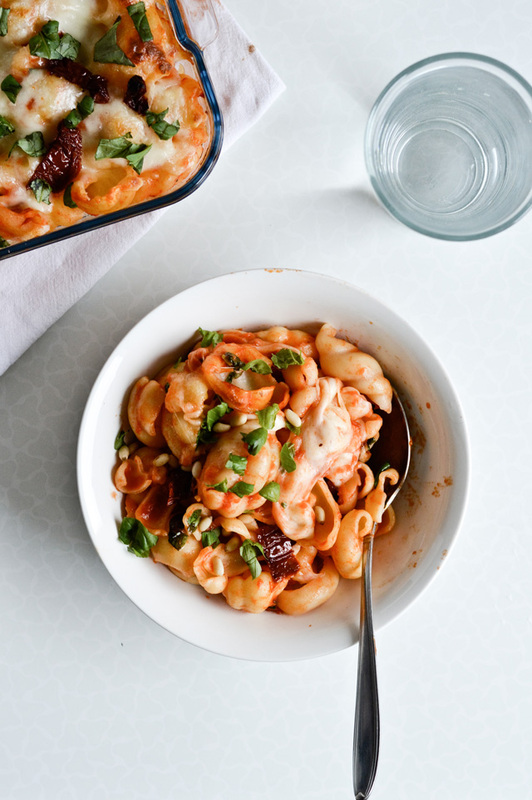 Because all you need next to pasta, sauce and fresh basil is lots of mozzarella cheese and some sun-dried tomatoes to scatter on top, for that extra tomato flavor. I also like to throw in some pine nuts, for a little crunch. 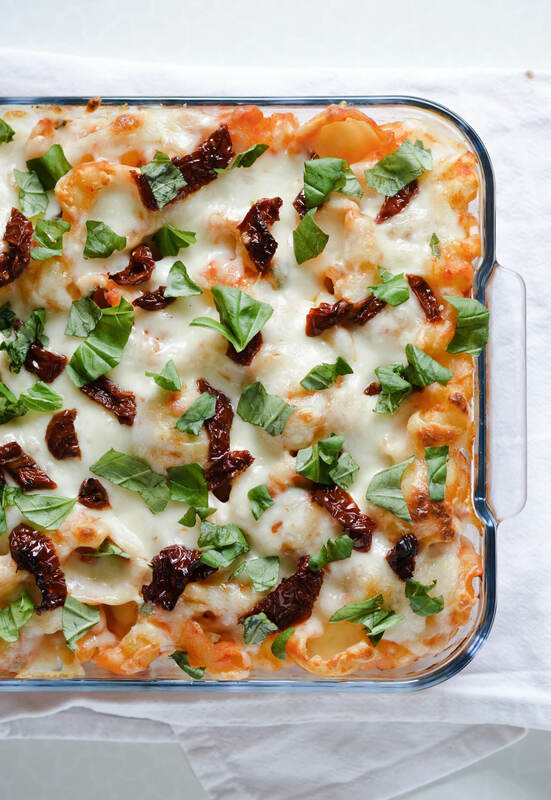 Because all these ingredients are available year-round, this mozzarella tomato pasta bake is a dish perfect for any season. 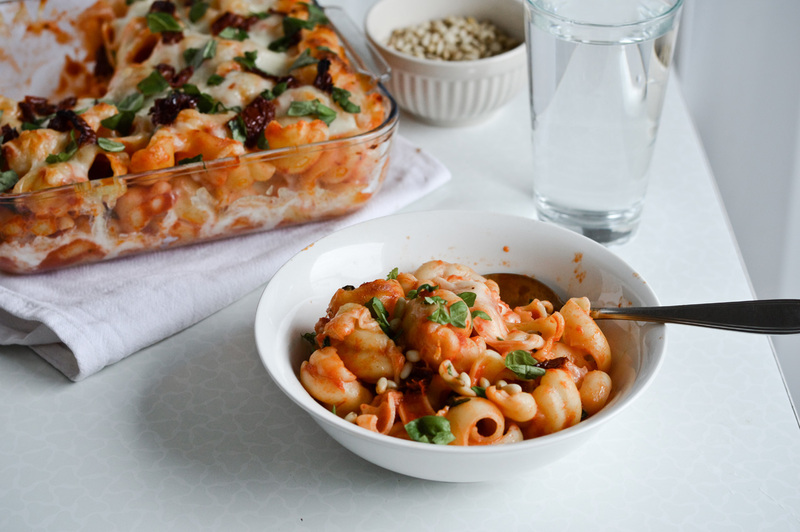 I like to serve this pasta bake in a bowl and eat it with a spoon, for that over-the-top comfort food vibe. Clearly, I really don’t need a lot to be happy. 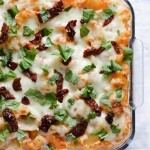 A perfect dish for when you want something comforting, but made quickly. Preheat oven to 392°F (200°C), grease a 12-inch (30-cm) square baking dish with olive oil, set aside. Bring a large pot of salted water to a boil. Add pasta and cook for 8-10 minutes (or as long as the package says so), until tender (not mushy!). Drain pasta, then transfer it to a large mixing bowl. Pour over tomato sauce and add 2/3 of basil. Stir gently until all pasta is coated. 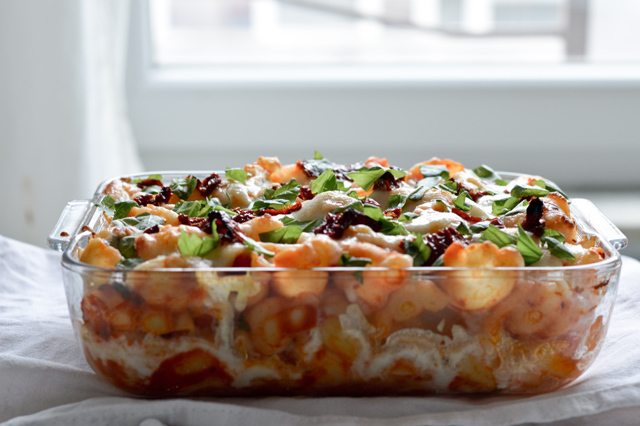 Transfer 1/2 of pasta to the prepared baking dish and spread around evenly. Sprinkle 1/3 of cheese all over. 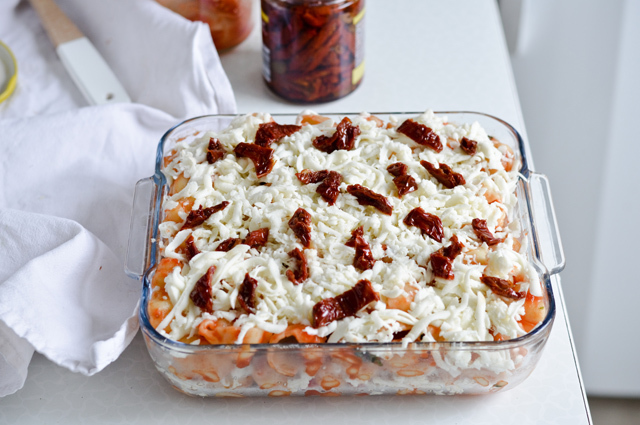 Top with remaining pasta, as evenly as possible and sprinkle with the rest of the mozzarella. Lastly, scatter chopped sun-dried tomatoes all over. Bake for 15 minutes or until the cheese is bubbly and completely melted. Remove from oven, sprinkle with remaining basil and serve. As you spoon the pasta into a bowl (or a plate) scatter some pine nuts on top. 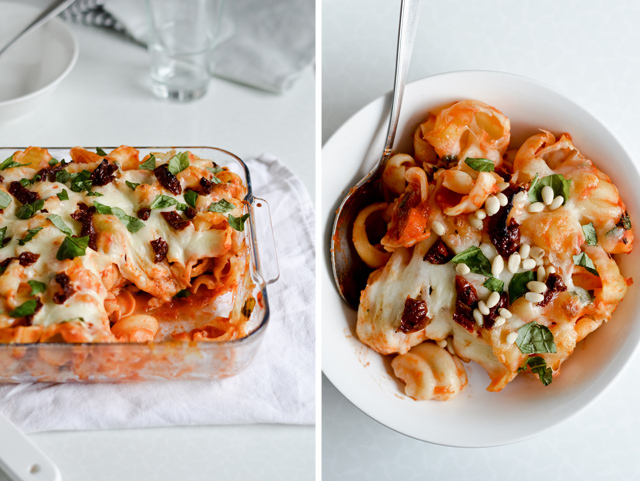 Store leftover pasta in an airtight container in the fridge and eaten 1-2 days. 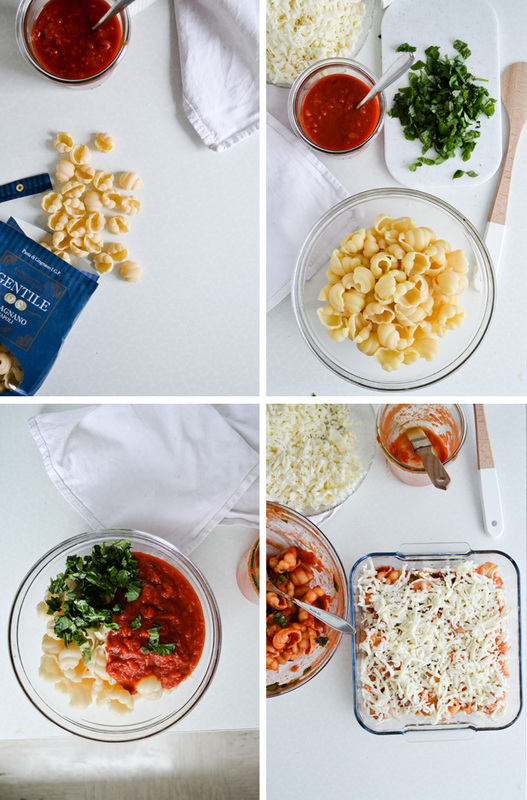 On type of pasta: The type of pasta I used is called gnocchi, but other similar types work too and I often use any of the following: fusilli, penne rigate, pipe rigate, ziti, shells, elbows, etc. Sometimes, when I end up with smaller amounts of various pasta, I throw it all together and make a mixed pasta bake.